Buddha’s Herbs is a family owned company, headquartered in New York, started and now managed by professionals, having vast experience in the field of Natural Products. Its name and operations are motivated by the teachings of Buddha and its logo also signifies Buddha’s positive attitude towards life. When the Buddha was young, he learned the science of medicine. He became knowledgeable about the nature and cure of diseases. 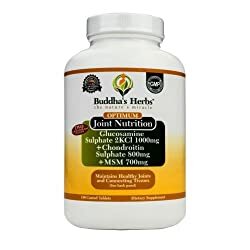 Buddha's Herbs Glucosamine, Chondroitin and MSM is a powerhouse formula dedicated to meet your joint health needs. Its GMP quality Glucosmaine + Chondroitin + MSM Combination provides efficacious quantities of glucosamine sulphate, chondroitin sulphate and MSM for supporting and revitalizing joint health.